Décor in the house will include a combination of familiar favorites such as trees, wreaths, and greenery, as well as more unusual elements sure to delight visitors. Whether originating in an atmosphere of wartime scarcity or in times of peace and plenty, holiday décor expressed Americans’ wish for a sense of connection with tradition and for festive seasonal changes. 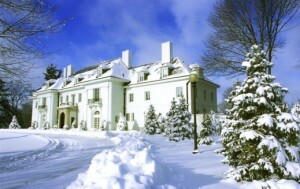 USA Today voted Christmas at Lilly House one of the top Indianapolis Holiday Attractions. Docent-led tours of the Lilly House, with special anecdotes about the holiday season are available.